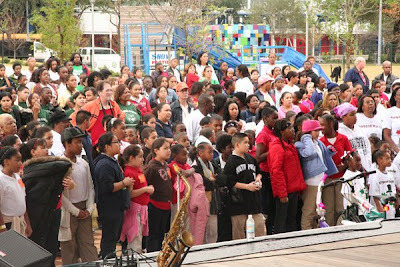 On December 18, Houston City Council Member Jarvis Johnson invited underprivileged students from his district to reward them for their academic excellence at his annual Winter Wonderland event at the Discovery Green Park in downtown. A total of 20 schools from District B brought 25 students each. Students with the most improved academic record were chosen to represent their schools and one person from each school was awarded a bicycle. But everyone walked away with a gift. They also enjoyed the 50,000 lbs of snow that the council member had shipped in. "By rewarding the academic success of the most improved students, it is my expectation that other students will strive harder next year to achieve the same success," stated Council Member Johnson. "I had a lot of fun", said Kaliyah Henix, 8, of Benji Academy. Her teacher, Ms. Ramos, added that "this was wonderful and so needed because most of these students don't get to experience something like this." Lisa Felix, co-founder of PDK Sorority, was elated that her organization could be apart of what she called "a wonderful and grand experience. We wanted to give back to the community in some way so we got with Mr. Johnson to giveaway the bikes. There is no feeling like giving." 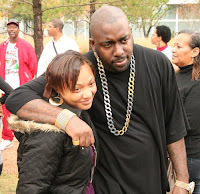 Houston Rap artist Trae The Truth was also on hand to speak to the cheering students. "You all keep up the good work in school. Whenever there is something like this going in the community for the youth I am going to always try to be there", he said.